A few minutes from the historic center of Orvieto, immersed in the magnificent countryside, Lavanda & Rosmarino is the ideal place to spend wonderful days in total relax and entertainment. Lavanda & Rosmarino is situated in a strategic location. Just outside the small village of Canale Nuovo, guests have access to a few hundred meters of shops for every need, from the legendary butcher Donatello, where you can buy the best of local meat, a supermarket and a bar-restaurant. Mass is celebrated in the church on the square in Canale Nuovo. LaThe countryside around Canal is considered the most beautiful in the surroundings of Orvieto; along a hill 300 meters above sea level we find numerous olive groves and rows of vines at the companies where you can taste local products and buy wine, oil, and other specialties of the generous Umbria, directly from the manufacturers. The temperature is ideal for both residents and travelers: sweet in spring, hot in summer, but always slightly windy, cold but not too much in winter. 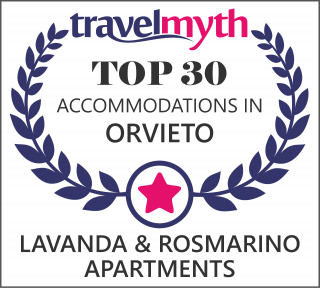 Lavanda & Rosmarino is about 10 mins drive from the center of Orvieto, as well as from the toll. Guests can enjoy the lively atmosphere of this beautiful city of art, full of magnificent works: the Duomo, widely considered one of the great masterpieces of Gothic/Baroc architecture, and teeming with cultural activities, mainly focused on music, theater and food. Orvieto was in fact one of the first places, in 1999, to be certified as a Slow City, and the city offers a large number of excellent restaurants where you can taste the “baffo” and umbrichelli with black truffle. At Lavanda & Rosmarino Paolo and Alessandra offer accommodation to meet the needs of all kind of guests. A magnificent swimming pool of 14 meters by 6 will allow you during the summer to relax and get back in shape by swimming and enjoying a stunning view in the most desirable quiet. You will restore home smells and the colors of thousands of plants in the garden. The owners speak good English and French. The three apartments are differently sized, attached to the old farmhouse owned by the family, and are fully autonomous as fully described on this site. Kitchen fully furnished and equipped with a gas stove with four burners, electric oven, dishes, pots, pans, toaster, juicer, coffee maker, kettle. Paolo and Alessandra love to find guests a small welcome kit with basic groceries. If you arrive in the evening or during the holidays, breakfast is assured!